There is a new retirement plan in India designed through a mutual fund that is launched by Tata mutual funds called the ‘Tata retirement saving plan’. The company is trying to market it using a word 30-30 challenge which says that there are 30 yrs of our work life and then 30 yrs of retirement life and you need to plan for the next 30 yrs in the first 30 yrs. The plan is currently at NFO stage and will be open till 21st Oct 2011. There have been some readers who enquired about this plan in our forum. Let me review the plan in this crisp article. Basically this plan has 3 different kinds of funds inbuilt which are called as 1) Progressive Plan, 2) Moderate Plan and 3) Conservative plan which all have different risk profiles (risky, balanced and safe). As per the asset allocation rules the investor’s money will be moved from one fund to another fund as per his age. So all investors who are below 45 yrs age will be in progressive fund (highest risk), then once they reach 45 yrs, their money will be moved to moderate plan and once they reach 60 yrs, they will be moved to the safest option called conservative plan. 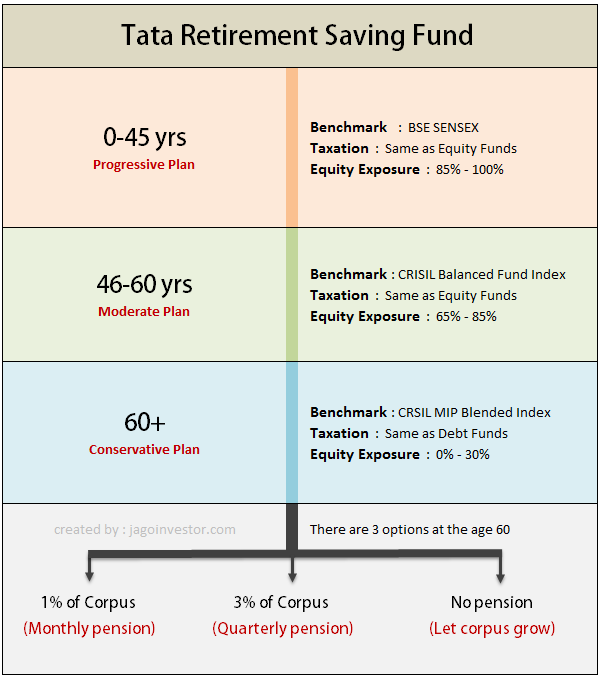 Once investor reaches 60 yrs of age, he will be getting pension from this plan in form of SWP (systematic withdrawal plan) which is nothing but a known way of withdrawing out of mutual funds systematically. There will be option of getting 1% of corpus monthly or 3% of corpus quarterly. Let’s see this auto switch and auto withdrawal options in a little detail. There is an auto-switch facility in this plan, which means at each milestone you will be automatically be switched to the next fund without any exit load. So when a person reaches age of 45, he will be switched from Progressive plan to Moderate plan automatically and when he reaches age 60, he will be auto-switched from moderate plan to conservative plan. Note that one has to choose for auto-switch option at the time of buying the plan. One can also switch between the funds manually whenever they want, but in that case if the switch is before 5 yrs from the date of enrolment, there will be exit loads applicable, but if 5 yrs has passed, then 3 exit load free switches will be allowed. A feature called Auto systematic withdrawal plan is there in this plan, which will start redeeming your funds and start giving you your money in the form of pension. There are two options in this. In the first option you can get 1% of your total corpus each month and in second option you can get 3% of your corpus each quarter, as decided by you. You will also have an option of not taking any pension amount through SWP route if you wish. So one can just leave his money in the fund and let it grow. As this is a long-term investments tool, the early withdrawals are discouraged and the exit loads are high. There is no exit load if you withdraw your money after 5 yrs of investment, but if you withdraw your money before 5 yrs there are high exit loads. The exit load comes down by 1% each year till 5th year. So in first year, the exit load is 5%, in second year its 4%, in 3rd year its 3% and so on… At last after 5 yrs, there is no exit load. As per the plan mandate, fund manager can also take upto 10% positions in derivative products ,which can be quite risky. These kind of plans are much better than regular pension plans as there is a good enough equity component which is good for long term. As this is a NFO , one can not be sure of its performance, features are ok, but the real thing would be the performance of the fund. The exit loads are high in starting years, which makes exit not so attractive incase the fund performance is bad and one wants to get out of it. The fund has features which will come into effect after many – many years. For a 25 yrs old, we are talking about 20-30 yrs from now when the auto switching will start happening. It’s quite early to comment on how it will turn out then, because there is not much history at the moment about the performance of mutual funds with such long durations. For Jagoinvestor readers who are quite pro in themselves, the personal suggestion would be to make their own diversified portfolio and have a full control on what they can do with it. This fund look good from features point of view, but it’s mainly for non-DIY kind of investors. As i have tracked this fund performance through moneycontrol.com, Performance of the fund is up to mark and im thinking to invest in this fund. But i have a small query. I would be glad if you can answer this. Is this fund (Tata Retirement Saving Funds) do have Income Tax Excemption? Im already investing in UTI Retirement Benefit Pension Fund which is under Tax Excemption under 80C. So, please let me know if this TATA fund also comes in to Tax excemption. I have started sips(monthly) in the following mutual funds. Are these funds make a balanced portfolio or any change is required?Further I want to invest 5000/- more per month through sip.Should I continue with these or I should choose some other instruments.Right now tax saving is not a issue for me and my time horizon is 5 years.AS i am new to mutual funds please guide me. I had invested at the initial stage of around 100000 over three years and it has grown to 144000(all figures approx). Fresh comments from your side as an advisor/analyst would be nice. Article is extremely good. Would you lile to do a follow-up review in current times? Anjani, review for the same fund ? Yes. I wanted to know does this make sense in today’s situation since the article was published in 2011. It has its own limitations .. You should rather invest in pure equity funds to build your corpus right now . I’m planning to invest 1k for the next 10years under this plan. Do you suggest its a wise decision? I have invested in the Tata Retirement savings Fund during Oct-Nov 2011. I will be 6o years at the end of Dec 2012 and expect to receive the Pension of 1% of corpus every month from Jan 2012. Is the pension income taxable? Yes, pension income will be taxable , it always is ! The scheme has been running for a few months now and the market has been on a yo yo.Now if the performance could be analysed(though it is still short term for definite analysis) and investment potential discussed. Points which go for it is the Tata name, long term duration for returns and one of the few retirement plans in our MF scenario. Can you suggest me a good pension plan . My age is 25 now & i am software engineer by profession. I have invested in this fund through SIP of Rs.1000PM with Debit-date of 1st of every month. Good one as usual. I would like you to comment on “Kotak’s capital multiplier plan” for the benefit of users which i feel is good one for retirement corpus! Plan looks good on paper, people at Tata have restructured basic-principles in the form of the plan. I think that the Target Date funds are still very premature in Indian market. A lot depends on the fund house performance over several years. Though it takes out the hassle of building perfect portfolio, a constant monitoring is still required. Plus considering its parallel with retirement fund, there is no tax benefit associated yet. I would rather wait for SEBI to one day to reform ELSS to such funds and some bigger fund houses to pitch in rather than offering FoF schemes. Keep an eye on such product for next 3-5 yrs and in the meantime stick to what Jagoinvestor says. It was short & good review. I prefer not to invest in this as it always carries an exit load with it, even after 5th year of investment @ 1% rate on NAV (Exit load is not applicable only after 60yrs of the investor). Like Mr. Praveen referred what if the fund doesn’t perform, fund can’t be exited without an exit load. I just had a look and i can see that there is a 1% exit load .. Yes , its one point which would really stop some one into looking at this plan. 1. DO NOT invest in any NFO. 2. Before investing, check the fund performance & history for atleast 5 yrs. Though past performance does not guarantee future returns, it gives you an indication. Not all NFOs are bad per se. If one were to follow your advise, then he would have lost opportunity in making money in such quality NFOs like the DSP Black Rock World Gold Fund, Religare Tax Plan, Axis Long Term Equity Fund, Fidelity India Growth Fund, ICICI Target Returns Fund, Mirae Asset India Opportunities Fund, etc. If the fund offers something different, then why not??? Except for the DSP Black Rock World Gold Fund, I don’t think there was any new thing offered on all other funds. Its only at a future date you can say that investing in NFO was profitable. In the meantime I am sure there would be several ongoing funds which would have given similar and higher returns in the same time period. So NFO or no NFO really doesn’t matter much, its mainly meaningful diversification of portfolio which is important. Precisely what I mean in saying “Most of us never see more than a few lacs in our hand in the first one-third of our lives. Yet we dream about a big magic stash of crores waiting for us right at the end of the second one-third of our lives.” in my article. I read your article .. while you are very true in what you said in your blog, one thing happens with traditional method and thats is it gives a good “start” to lot of people . I am with you when you say what about uncertainities of life in between those 30 yrs .. well thats something one has to deal with and has to be very committed in reviews his overall financial life and what restructuring is required .. which is why reviews are there in financial planning and only a few of planners do that with their clients . I feel this is good fund addressing the needs for saving for retirment, though it looks like a clone from the insurance industry/NPS. The exit load is just a deterrent for people not to exit. The surrender values in the initial years in pension funds is very high as compared this scheme. Also there is no compulsion to buy an annuity after the age of 60. One can withdraw the entire amount and invest suitably at that point of time. Overall I think, this will be a beginning for many other fund houses to review their policy to attract money for long term. Most people exit or break their SIP within 2 to 3 years, a retirment fund fills up the emotional quotient to remain invested for longer periods. Yea .. as i said in the end of the article .. and you said that same thing that for a lot of people this fund looks good , if they want to not get too much involved with their fund . Good review. Agree with Praveen. I will not invest in this fund. I am more than happy with my existing SIP’s in Equity diversified funds. Good , thats a personal choice and i think if you have already planned for your investments , you dont need to disturb them 🙂 . Would you be kind enough to give me the details of the SIP you are investing into and also the agent thru which you are dealing. I would like to invest and save in SIP’s but lack knowledge. Your tips would be very helpful for me. Thank you. While everyone is entitled to his opinion, I feel that with the pretty limited options available to investors in the retirement space, this Fund is a good choice. The fact that the Fund is New should not matter especially when the investment horizon is pretty long. However, if you have a Financial Advisor, then he should be able to prepare a Better and definitely more diversified portfolio for your retirement. Yes ,I agree that given a lot of other choices we have in indian space, this one beats a lot of them and is a good option . but given we are not sure how the fund will perform, dont you think it would be a wise choice to wait for it ..
What do you think is the best part of this fund ? What makes you think that its a good investment option ? How i can invest in this? what are the different way of investing in this fund?